Following a bitter legal battle over his late father's belongings, archaeology student Ben Rutherford (Dorman) inherits an unusual antique, a strange 18th century mechanical device known as "Le Vaudou Mort". Later, after a party at his university campus, Ben flaunts the machine in front of a group of his close friends. However, when it disappears from his room the next morning, things take a sinister turn when Ben discovers the device may have deadly supernatural powers and, one by one, his friends begin to die under strange and horrific circumstances. Realizing the police are unlikely to believe his theory regarding what he believes are murders, Ben reunites with his estranged half-brother, Marcus (Fimmel), a forensic photographer, and delves deeper into their father's past to work out who could be behind the grisly killings. As the terror mounts and the clues seem to suggest the unthinkable, the race is on to uncover the truth before Ben and Marcus join the growing list of victims. Director John V. Soto follows up his debut feature Crush (which he co-directed with Jeffrey Gerritsen) with Needle, a new and refreshingly original slasher movie with a supernatural twist starring Ben Mendelsohn (Animal Kingdom; Beautiful Kate; Knowing; Australia), Trilby Glover (William And Kate; Righteous Kill), Tahyna Tozzi (X-Men Origins: Wolverine), Jane Badler (V), Michael Dorman (Daybreakers; Triangle), Travis Fimmel (The Beast) and Jessica Marais (Packed To The Rafters; Legend Of The Seeker). 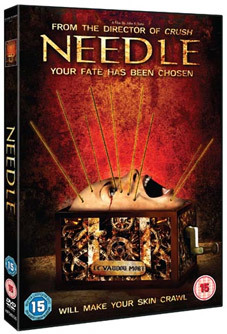 Described by Louise Keller in Australia's Urban Cinefile as "an excellent genre film and one that is deserving of a wide audience," Needle will be releaesd on UK DVD on 13th June 2011 by High Fliers Films at the RRP of £12.99.